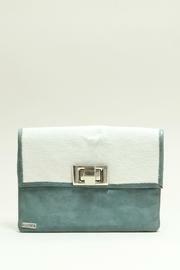 This is a sophisticated clutch in a blue leather, its name is Isabel. Zippered and leather lined. The leather has unique characteristics in tone because it is natural, therefore, the bag acquired is unrepeatable, different and exceptional. This bag is made with leather obtained from animals raised specifically for food consumption.